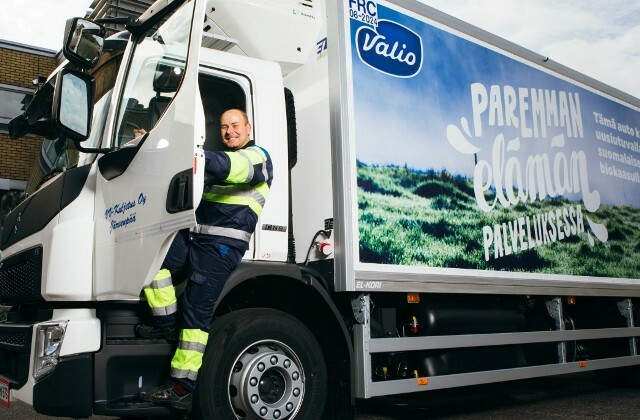 The Finnish dairy manufacturer Valio’s first biogas-fueled delivery vehicle was taken into service in the Helsinki Metropolitan Area in September. Valio also takes part in the biofuel production by supplying waste generated in food production to Gasum’s biogas plants. The biogas pilot was inspired by Valio’s circular economy with the aim to recover the waste generated in dairy production. Renewable and 100% Finnish biogas can help achieve substantial cuts in transport emissions. “We want to test new, environmentally sound fuels. Feedstocks used in biogas production include inedible side streams from Valio’s production. This is circular economy at its best,” said Mika Jyrkönen, Logistics Manager, Valio. “It’s great that Finland’s leading dairy product manufacturer is able to utilize its own waste as an environmentally friendly fuel and that way reduce its emissions. Biogas is financially competitive compared with other biofuels. In Finnish transport, 40% of emissions come from heavy-duty transport and therefore this sector is under particular pressure to cut emissions,” said Gasum Sales Manager Juha-Matti Koskinen. Valio’s new biogas vehicle is a step towards low-emission dairy deliveries. It is also in line with the targets set by the Finnish Government and the EU to increase the number of natural gas vehicles and reduce emissions. The transport use of biogas helps reduce fuel lifecycle greenhouse gas emissions by up to 85%. During the joint project, the biogas delivery vehicle will transport Valio products from the main warehouse in Helsinki to shops in the Helsinki Metropolitan Area. This area was selected for the pilot due to its good natural gas distribution network: Gasum has more than ten filling stations there. A new station was also opened in conjunction with the IKEA store in Vantaa in September. Delivery route efficiency is important for Valio and therefore the locations of filling stations also need to be taken into account in route planning. The collaboration launched in September involves testing the biogas truck as regards operational reliability and costs, after which the potential for continued use will be evaluated. At Valio, seeking environmentally friendly solutions goes beyond this vehicle, as the company is planning to try out a natural gas milk collection vehicle in the future.